Agra Fort has Beautiful Architecture and Amazing History! 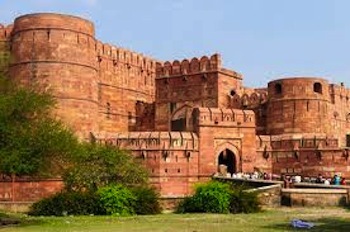 The Agra Fort is located in the city of Agra, in the state of Uttar Pradesh India. The fort is like a little city protected within its walls, and it's located only about a mile and a half from the world famous Taj Mahal. The fort is a collection of protective walls, palaces, water wells, a mosque, towers and more. It was supposedly first occupied by Hindu Sikarwar Kings, but there is little written history until a Sultan named Sikandar Lodi moved from Dehli to rule the country from the Fort between 1488 - 1517 AD. 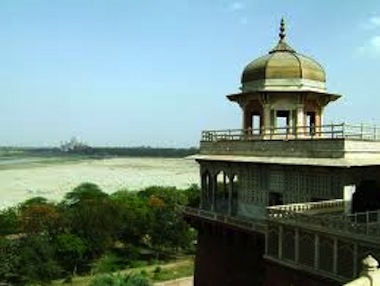 Agra was the second capital of India for some time and the Agra Fort was the capital building. Dehli was and remains the primary capital of India. Lodi passed away in 1517 and his son Ibrahim Lodi ruled for nine years, but lost power when he died in the historic first Battle of Panipat in the state of Haryana. During his rule, he built several palaces, drinking wells and a mosque. Following his death in battle, Mughals were able to seize the fort and take its great treasure, which included a famous diamond called Koh-i-Noor. Subsequent Afghan rulers; Babur, Humayun, Bilgram and Sher Shah held power here until the Mughals defeated the Afghans in the second battle of Panipat in 1556. The history of the Agra Fort really gets very interesting when the Mughal ruler Akbar was in power. 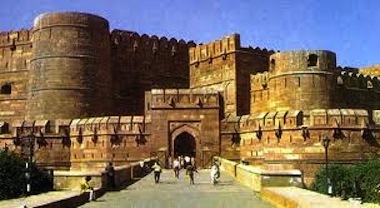 He realized the importance of Agra's location and made the fort his home in 1558. At this point the fort is comprised of worn down bricks. In order to rejuvenate its appearance and structure Akbar had the fort rebuilt with sandstone that he obtained fromRajasthan. It took 1,444,000 workers eight years to complete the fort, it was finished in 1573. The colorful history of the Fort did not end there. Akbar's son, Shah Jahan made changes and additions to Agra Fort that left it in the condition tourist of India find it in today. Legend has it that Shah Jahan built the beautiful and nearby Taj Mahal for his favorite wife Mumtaz Mahal, who died at a young age. Shah Jahan had an appreciation for white marble and built the Taj from white marble. He also created several buildings within the fort from white marble with gold inlay. Towards the end of his life, Shah Jahan was imprisoned in the fort's high tower by his own grandson, Aurangzeb. It's said that Shah Jahan died in the tower with a balcony view of his beloved Taj Mahal. The Fort was the battle location of the Indian Rebellion of 1857, which caused the end of the British East India Company's rule, but led to India's direct rule from Britain. The beautiful fort is a fantastic India tourism destination! It's full of rich history, culture and has a wonderful view of the Taj Mahal, located only 1.6 miles away. For all of these reasons it is a must see destination! Leave Agra Fort to explore other popular India tourism destinations. Visit our homepage to discover more of India. If you like our site and want to build your own about your favorite topic, check this out!